Resource Guarding, or…why won’t my dog let me near him when he eats? So, your dog freezes and growls when you walk past his food bowl. He cowers and hides with his bones, standing over them threateningly when you go to pick it up to put it away. You heard somewhere that you need to ‘claim’ these items for yourself, and place your hand in his bowl when he’s eating to learn that its YOUR food and he only gets to eat it on your say-so. You’ve been doing this for a few weeks but it only seems to be making the problem worse. You stop giving bones altogether and you make Fido eat in the garden. You’re concerned that when your niece comes to the house, the dog won’t understand that she’s the boss too, and that he might try to take something from her hand and nip her. Well, there is good news and bad news. 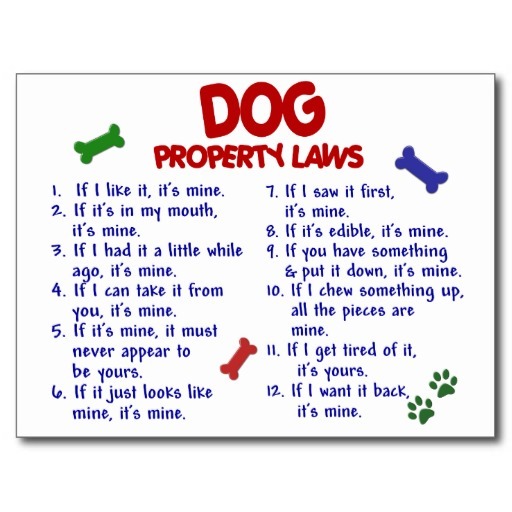 The good news is, you don’t have to follow crazy rules to be the boss of your dog. More good news is, this is treatable in the majority of cases. The bad news is, ‘claiming’ your dog’s toys and bones and placing your hand in his bowl may have made the problem worse. (That’s okay, you can just stop doing it now and move forward). So, what to do? First off, realize that what your dog is doing is a natural behaviour. He has something and he doesn’t want to lose it! He is afraid that if you take it, he won’t get it back. Imagine your neighbour asks to borrow your blender for a party, but fails to return it. When he comes to ask you to borrow your lawnmower, you’re probably not going to want to give it to him. If he tried to forcibly take it from you, you would probably get into a physical confrontation with him, or call the gardai. Your dog doesn’t have the option of saying ‘no’, except by growling. Physical confrontations initiated by the dog are seen as ‘aggressive’ rather than possessive. So the very first thing you need to do is try to understand this from the dog’s point of view. The next step is to teach the dog its a good thing to have you near when he is eating or has a prized bone by throwing tasty tidbits towards him as you walk past (again, we are leaving the food he already has in his bowl and not even looking at his bone). We keep doing this until they are happy and comfortable to have us standing near them. After that, we teach the dog that its a good thing to give us items they love, and they get them right back! Teaching a solid ‘Drop’ cue will help, but don’t attempt this with items the dog guards to start with. Start with toys that the dog will happily exchange for a bit of chicken and work your way up to the things he loves. To avail yourself of a step-by-step, easy to follow workbook, get in touch. You can get the plan via email for €25.00, including support by telephone and email, or you can book a one-on-one consultation to have me come to assess your dog and demonstrate the method in person!